Actually, it’s my first Christmas outside the United States! I’ll be in Lund with my husband and his parents, his sister and her family, and some family friends. I’m looking forward to it. In the US, I always looked forward to baking Christmas cookies and getting gifts for my family and friends. Sometimes my gifts are homemade, sometimes bought at a store, but I love brainstorming the perfect thing for someone. Here, though, the season is full of Christmassy activities: attending glögg parties, decorating the house with lights and going to Christmas markets. It’s the active part of the holiday season that I like the most in Sweden. Totally online and hopefully Skyping with my family and friends on a regular basis. My husband and I just got married and it was a sort of spur-of-the-moment decision, so we’re sending a combination Christmas/“Oh hey, we’re married!” card. We’ll be writing thank you’s to the people who were there and a little update to people who weren’t. Panettone. My family eats this traditional Italian holiday bread for Christmas breakfast with fruit salad, coffee, and mimosas every year. They sell it in Sweden, too, so I’ll be introducing the tradition here. Have you read any good books this year other expats or “internationals” might enjoy? 2) A Supposedly Fun Thing I’ll Never Do Again: Essays and Arguments, by David Foster Wallace (Little, Brown, 1997): His essay on taking a week long cruise in the Caribbean was so true and so funny that I laughed out loud at several points. No travel dreams for Christmas unless it were to assemble my family and my husband’s all in the same place at the same time. But for New Year’s Eve, I’d love to return to the countryside in County Cork, Ireland, where I went two years ago with a group of eight friends, one of whom has a cabin there. We would all hole up that cabin again to eat, drink lots of champagne, and welcome in the New Year. Despite having attended some exciting New Year’s Eve parties in the U.S. and Europe, I’m not sure I would want to spend New Year’s Eve with a famous person I didn’t feel close to. That said, Dorothy Parker would be hilarious to sit next to at an event like New Year’s Eve — as long as she didn’t turn against me. I would just want to be a fly on the wall. Two days come to mind — both having to do with the Fourth of July, not Christmas. The first was in 2010. I had flown back to the States for my friend’s wedding, and then on July 4th I had to fly back to Vienna to go back to work. I spent the entire day in the no man’s land of the Charlotte, JFK, Dusseldorf, and Vienna airports. (I am an extreme budget flyer.) Actually, I’m not sure whether this counts — I didn’t really experience a displaced holiday; I just missed it altogether. The other time was July 4, 2009. I was spending the summer in Sweden with my then boyfriend (now husband) — my first extended stay in which I started to really get to know his friends and family. We tried to throw a 4th of July party, but something was off. We grilled, we had flags, we had Jell-o shots for a little novelty Americana, but there wasn’t any patriotism and there weren’t any fireworks. For me it felt like a regular barbecue party trying too hard to be something else rather than an actual holiday. Again, it wasn’t Christmas but Thanksgiving, in 2010. I cooked a traditional Thanksgiving feast with all of my mom’s recipes for almost 30 Swedes. We borrowed a friend’s parents’ apartment to fit everyone in, and it was the coziest, most wonderful celebration. My husband downloaded the Macy’s Day Parade for me as a surprise and streamed it while we were cooking and eating. Best of all, one of my Swedish friends asked me halfway through the meal, “Aren’t we supposed to say what we’re thankful for?” I hadn’t wanted to force them to do that, but everyone got really excited about it, and the whole group took turns saying what they were thankful for in what turned out to be really beautiful toasts to the people in their lives. It was amazing. Rested but a little bit sad. So much energy goes into enjoying the holiday season, anticipating Christmas and New Year’s, gift-giving, baking, merry making — and then suddenly it’s all over! And you’ve got all of January and February to slog through until spring is on its way again. 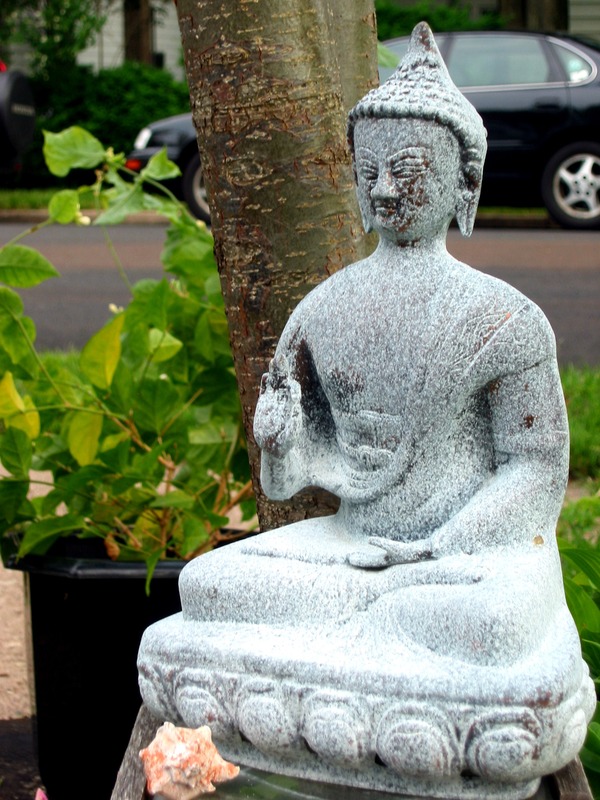 STAY TUNED for Monday’s post, setting a new theme for the month’s posts on the connection between the displaced life and spiritual awakenings. Peg will arrive three weeks before I do, so the first thing I want to do is hug my wife. After that I’ll put my feet up and relax after the long flight from Rio for a few hours. That night we will spend the evening with good friends we haven’t seen in way too long. Relax. We are living in Brazil while I’m working as a manufacturing and production manager in the oil and gas field. The growth in the industry has been enormous. I’ve been working long hours, and long weeks, for too many months. I’m going to turn off my phone, keep my laptop shut and switch my mind off. Pegs is the Internet junkie of the team so I trust she’ll let me know if anything important happens out in cyberworld. 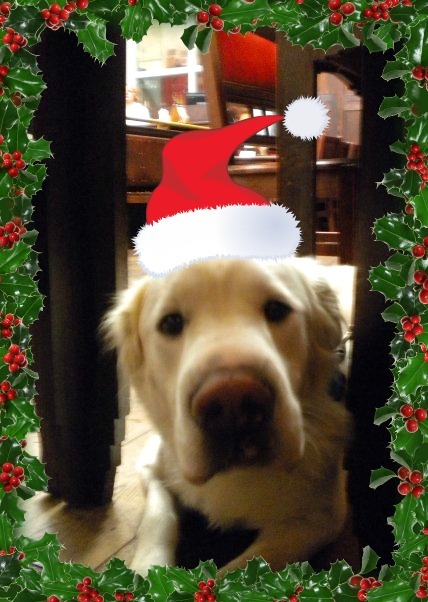 Peg will send a few Christmas cards for us. As for a Christmas letter, we do too many things and go to too many places each year to write something brief. Our family and friends who want to know more about what we’re doing can take a look at our Web site. A bloody decent whiskey, and a tin of haggis. If I can find a good smoked mackerel, I’ll eat that too. I really wish I could get my hands on an Orkney black pudding. Because of work I haven’t had time to read a single book all year, unless you count industrial engineering books as a good read. But Peg always has her nose in a book. Right now she says she’s really enjoying Barbara Kingsolver’s The Poisonwood Bible. The sense of stepping into another world is something any traveler or expat can relate to. If you could travel anywhere for New Year’s Eve, where would it be? I’d love to do an Old Year’s Night in Comrie, a small village in the Scottish highlands. As I remember, its Hogmanay ritual starts in the evening with the kids in a fancy-dress parade riding on the back of a lorrie — a kind of float. That goes on until nearly midnight, when the whole community gathers at the bridge on the side of town near Oban and throws three flambeaux (flaming torches) over it into the River Earn. Then there’s a procession through the village with a pipe band leading the way — the villagers in the middle, the float bringing up the rear. When they reach the bridge at the other end of town, they throw the remaining flambeaux into the river. The whole thing is a ritual to protect the village from evil spirits for the year. Back in the center of town the party, including a céilidh, will go on for hours. My sister has lived there for the past twenty years. Someday I’ll take Peg back there to show her how my family of Scots does an old fashioned Old Year’s Night properly. What’s been your most displaced celebration of the holidays? My first Christmas in Houston. I spent the day in shorts, roasting by the pool. It just doesn’t feel like Christmas without freezing your b*******s off. How about the least displaced — when you’ve felt the true joy of the season? Even though we live in Brazil, we always go back to Houston to spend the holidays with Peg’s kids. I’ve enjoyed the last few holidays with them, among new family, but I still don’t feel at home as much as I did back in Scotland– especially since I’m so far away from my own adult sons. However, last year was a bit more exciting because Peg and I had a big secret plan between us. On Boxing Day we hopped on a plane and flew to the Caribbean. One long haul, three airports, three islands and one ferry later we arrived on St. John in the US Virgin Islands, where we eloped on the beach on December 28th. 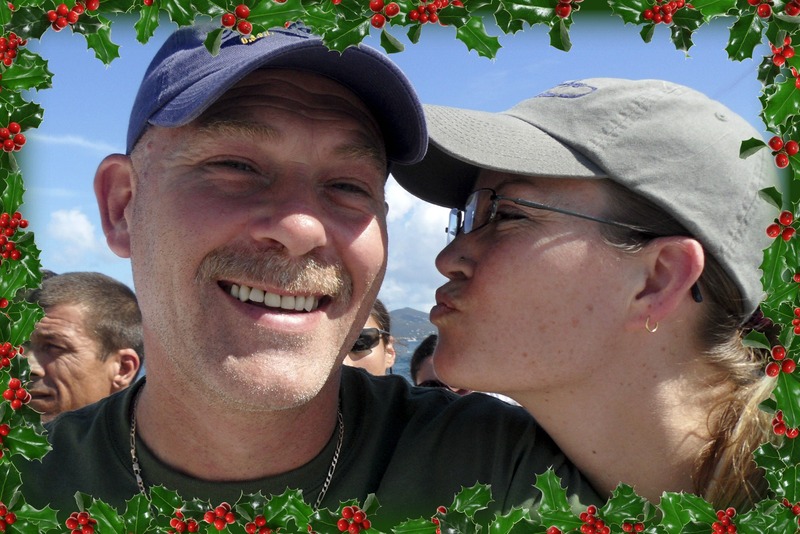 The photo above was taken of us on the ferry ride over to the courthouse in Charlotte Amalie to pick up our marriage license the day before. This year, of course, we’ll have our first anniversary! It’s a bit anti-climactic. I start the new year with a long flight back to Brazil, which is a country we love living in, but it means back to work for a while. When my job is done there, we’ll have more time to travel when we please. In the meantime, we’ll enjoy as much of Brazil as we can. We both love to travel and look forward to the day when we can just keep going. 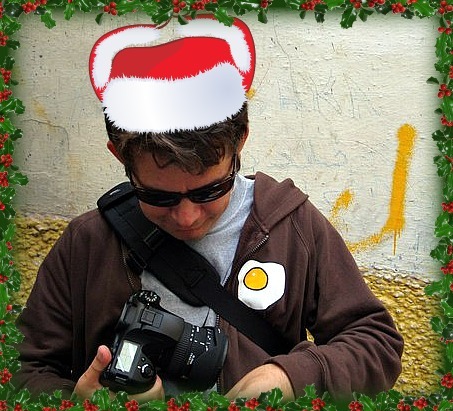 STAY TUNED for tomorrow’s featured nomad (4/12) in our 12 Nomads of Christmas series. Countries, states, cities lived in: Washington (Yakima, Tacoma, Spokane): 1989-95; Alaska (Anchorage): 1995-97; Bolivia (Bañado de la Cruz & Santa Cruz): 1997; 1998 – 2002; Washington (Seattle): 2002-03; Massachusetts (Cambridge): 2003-05; Guatemala (Guatemala City): 2004; California (Duarte): 2006-10; Colombia (Bogotá): 2010 – present. *My passport is only three years old, but multiple entries to about 40 countries filled it right up and I’ve had to add more pages. By the end of this year, I will have slept somewhere other than home about 190 of the 365 nights. My late first wife and I wanted to make a difference in the world and were particularly passionate about issues of justice, peace, and poverty. After graduating from university, we decided that maybe the best place to match our greatest gifts with the world’s greatest needs was in the public policy arena. We thought it would be good to represent a view on behalf of the marginalized — those uninvited to the table where policy decisions are made that nevertheless affect their lives in profound ways. In particular, we were thinking of illiterate poor persons living in underdeveloped countries ruled by bad or incompetent leaders and subjected to all the crap that comes with weak institutions of governance. But we realized it would be pretty lame to run off to graduate school straight out of undergrad and then find some job in a policy think tank or as a Congressional aide in the hopes of working our way up to having a place at the table with a mind to represent these unrepresented views when we really hadn’t a clue what they were. So we made a three-year commitment with the Mennonite Central Committee to go live and serve in a Bolivian village with people who fit this description. We were young, hopeful, idealistic, earnest, and naïve. I can say that I’m not so young anymore. Is anyone else in your family a “displaced” person? I have a brother who served in Iraq for a couple of years, but he now lives about a hundred meters from our dad’s house in Yakima, Washington. I’m really the only one in my family who has chosen a lifestyle for which the question “Where are you from?” generates a confusing jumble of explanation rather than a simple city-state combo. Unless you count my son, Thiago. He’s six and is definitely more “displaced” than me. He literally speaks of living in two different “worlds.” In one “world” he speaks Spanish, has a home and school in Colombia, where his sister was born, and has family in Bolivia (his mother is Bolivian). In the other world” — where he says he is really from — he speaks English and has friends in California and a large family on my side including a whole set from my late first wife. Yesterday he told his mother: “My brain is confused, I don’t know where I should live. All my friends are in California, but my cousins are in Bolivia, and I go to school in Colombia and have friends there, too.” Poor little nomad. For me the question was “How the hell did a small town boy from Montana end up here?” Physically, at that moment, “here” was a stainless steel operating table in a dark and empty hospital room in Santa Cruz, Bolivia. But more profoundly, “here” was a situation so far from my expectations, I was literally struggling to connect the dots and figure out how I had gotten myself there. I was 25 years old. Somewhere in a ravine a hundred miles away lay the broken body of my wife. A few hours earlier, the public bus in which we were riding had missed a turn on the narrow, winding road that passes through the Andean foothills and tumbled 1,000 feet into the dark. She and I had gone to Bolivia with a long-term vision of our lives together, and now I was here, in a foreign land, alone, the slate of the future wiped clean. It was so profoundly disorientating, I just kept coming back to the question: “How did I get here?” Maybe it was a way to push off the searing emotional pain that would come with facing into my new reality, but the question wouldn’t go away. What sequence of events and decisions led me here? Did I make a mistake? I remembered scenes from my idyllic boyhood in small-town Montana when my whole world was contained in a 100- mile radius and a handful of friends and family members. How had the world gotten so big, so uncertain, so complicated? And what was I doing wandering around in it like a lost child? How had I gotten here? Much later, I would decide that I hadn’t made any mistakes. My first wife and I had made decisions based on a set of values that we held in earnest and I continue to hold. The fact that those decisions led to tragedy does not diminish the certainty of those values — it just means that those who hold them are not exempt from catastrophic loss that come to all who live. I know you were probably hoping for a funny anecdote about crazy food or wacky cultural misunderstanding, but this is my one true displacement story. Nowadays, I feel a sort of indifference about the whole location thing, to be honest. Whether I’m living in Cambridge attending the Kennedy School of Government, or setting up a new home in Colombia, or sitting where I am at this moment at an outdoor bar in a hotel in Bamako, Mali, I feel neither particularly at home nor particularly displaced. Feeling at home has a lot less to do with place than it used to, and it’s often unpredictable. I can feel more at home in Albania when I have a good macchiato and an Internet connection to video Skype with my children than I might in a hotel in Atlanta after a missed flight, with a dead computer battery. I can feel more at home when I’m sharing a beer with a fellow expat I’ve just met in rural Cambodia than I might sharing a beer with an old friend I grew up with who never left Montana. I’ve experienced profound moments in my adopted homelands — from becoming a widower, to getting married, to rejoicing at the birth of my daughter, to undergoing major medical treatment. In each of these, it was the people who surrounded me that made me feel at home, and the uniqueness of the event that made me feel displaced. The location or culture has ceased to hold much power over my perception of self at particular moments. I’ll bring my wife from Bolivia, my son from the USA, and my daughter from Colombia. They are certainly a curious bunch, but I can’t live without them. You may add one word or expression from the countries you’ve lived in to The Displaced Nation argot. What will you loan us? I think I’ll pass on this one. Pole sana (so sorry!) as we say in Swahili. Actually, maybe that’s a good one. Pole (pronounced POH-lay) doesn’t have an exact English equivalent — it’s used to say you empathize and understand someone’s problems, without the connotation of inferiority that “I pity you” might have. This month we are looking into “philanthropic displacement” — when people travel or become expats on behalf of helping others less fortunate than themselves. Do you have a role model you look up to when engaged in this kind of travel — whose words of advice you cherish? I’ve never really had a specific role model for philanthropic displacement. That said, I’ve always been impressed with people who make long-term commitments to live among the people they wish to serve and voluntarily forego access to comforts and safety they might otherwise enjoy. There are some famous examples like Mother Theresa, but the ones that have had the biggest personal impact on me are unknowns — volunteers and professionals I’ve met and worked with along the way. Such people taught me how to live with a kitchen stocked with just 12 items — that’s counting the spices. They taught me how to bring my water up from the river in the morning and hang it in a tree from a bucket painted black so that the sun would heat the water throughout the day, in preparation for a warm evening bucket shower. I learned how to capture rain water, how to build dry latrines, how to trust local medicinal practices, how to enjoy silence, how to walk the equivalent of a marathon a day to visit local families, how to sit and unhurriedly share tea over conversations that circle around rather than cut to the chase, how to embrace simplicity as a virtue… I also forgot how to complain and remembered to be grateful in the midst of scarcity. Most of my role models didn’t do anything spectacular — they didn’t invent microfinance or the treadle pump, they didn’t negotiate peace accords or write a best seller. But the way they displaced themselves so thoroughly, the way they embraced their local communities with such authenticity — this had a big impact on how the communities valued their presence and their contribution, and on me. Voluntourism is said to be the fastest growing segment of the travel industry (itself one of the world’s fastest growing industries). Do you think this kind of travel can help the uninitiated understand the problems our planet is facing? Travel to a new place for three weeks and you can write a book, travel for three months and you can write an article, travel for three years and you’ll likely have nothing to say. There’s just something about a short and intense exposure that seems to set very strong ideas into the minds of those who’ve experienced it. But their ideas are biased by the specificity, narrowness, and brevity of that experience. For example, someone who has had a high-impact experience volunteering in an orphanage for a week may feel they know more about the issue than people who haven’t had that experience. In fact, they may actually know less due to the biases they have picked up. It’s like believing you know something about the average person in a country from a single observation. Sometimes, people know just enough to be dangerous; they mistake their shallow knowledge for an actual understanding of some enormously complex problem, and they act on it in ways that are ultimately irresponsible. The truth is, the problems facing our planet are complex and we should all be grateful for the specialists who have dedicated their lives to understanding and addressing them. Doing something serious about addressing these problems will require professionals, not hobbyists; lifers, not tourists. Again, it’s not necessarily a bad thing to pass through as a tourist, but with regards to your question here, we need to guard against self-deception. I’ve taken a few tours of a number of hydro-electric projects across the Western USA. I think they are really interesting. But, I know better than to believe I know the first thing about harnessing the power of water to generate electricity while balancing the ecological, economic, legal, social and political interests of farmers, consumers, industry, and the environment. Likewise, you can’t take a two-day tour of an urban slum in Kenya and think you understand poverty, urban migration, economic development, or whatever other angle one might give such a tour. img: Aaron Ausland in Mexico City (he’s the suit!). While on a lunch break from her work conducting a month-long operations audit of an NGO office, Aaron happened upon a lucha libre wrestling match putting on an outdoor show, and decided it would be amusing to pose with the star luchadore. Countries, states, cities lived in: Pennsylvania (Collegeville & Landenberg): 1985-87 & 1996 – 2004; Ohio (Cincinnati): 1987-96; Massachusetts (Boston): 2004-06, 2008-09; Argentina (Buenos Aires): 2007-08; Dominican Republic (Cambita Garabitos, San Cristóbal province): 2009-11; New York (New York): June 2011 – present. I guess you can say I left my homeland in search of a home. I never felt very “at home” as a teenager in Pennsylvania, so when the opportunity came to travel to Spain on a class trip I went eagerly. On this short trip I found that I felt more comfortable with some parts of the Spanish culture than with my own. The seed of wanderlust was planted. When I went to school in Boston at Northeastern University, I decided to study the Spanish language, partly because of my interest in the language and the culture of Ibero-America, and partly because of my wish to study abroad. Under Northeastern’s “Dialogue of Civilizations” program, I worked in Puebla, Mexico in a women’s prison, as well as in a small indigenous village in the mountains of Cuetzalan, where the people spoke only Nahuati. Both were amazing experiences. And under Northeastern’s study abroad program, I lived in Argentina for nearly a year — during which I decided I wanted to help impoverished people in developing countries so would try joining the Peace Corps. Two years and one Master’s degree later, I was finally accepted and sent off to the Dominican Republic. So did I ever find that “home” I was looking for? To be honest, my travels have only nurtured that original seed of restlessness. The more I travel the more I discover about myself and others — and the more I realize how much I still have to learn. For now, at least, home is wherever I want it to be. One night in Cambita my host sister’s husband brought me a guayaba (guava). He was really excited for me to try one for the first time, and I didn’t have the heart to tell him I had eaten this fruit before in Mexico. After I ate it I started to feel nauseous and dizzy. Soon my lips began to swell and my whole face was itchy. I was having an allergic reaction to a chemical (a fertilizer or pesticide) that had been used on the fruit. I called the Peace Corps doctor, who told me to take two Benadryl and then a shower to wash the chemicals off. When I got to the shower — an outdoor zinc and cement block latrine with a drain in the middle — I hung my towel on the cement blocks and poured cold water from a bucket over my head. It was already dark and I couldn’t see anything. As soon as I finished, I wrapped the towel around myself and as I was heading back to the house, I felt a small sting on my stomach, then another one on my back, and another one on my chest. Soon my whole body was burning with these sharp little stings. Inside my towel was a colony of fire ants! I ran to my room, only to find it occupied. My host parents, Doña Romita and Don Rafael, were busy adjusting a new table the latter had constructed from an old cabinet. All I wanted to do was rip off my towel, but I could not get naked in front of my 70-year-old hosts! By that time, the ants were all over my body. I was jumping up and down, shaking my towel and yelling for them to get out of the room. In all the commotion the oil lamp was knocked over and shattered on the floor. Doña Romita refused to let me in the room with the glass on the floor. Still unsure of what was wrong with me, she rushed me to her room. I quickly closed the door and whipped the towel off, slapping the ants off my body. Just when I thought the nightmare was over I looked up and realized the shades were wide open and everyone outside the house had seen me naked and jumping around. At that moment, Doña Romita knocked on the door to tell me that my project partner and his wife were there to see me. After being in the Dominican Republic for more than a year, I came back to the States to visit my friends and family. One night, while out with some friends all the girls couldn’t stop talking about their weight. They were commenting about how beautiful one of our friends was because they had never seen her so skinny before. All I could think of was how sickly she looked and how much I wanted to feed her. I couldn’t understand why being skinny was considered better while in the Dominican Republic being called “fat” or (my favorite) “fatty” was a compliment. My view of what was healthy and beautiful had been altered from my time in the Peace Corps. From Argentina: All the ingredients and utensils for brewing maté, a drink made from the leaves of the yerba maté plant, containing caffeine and related compounds. (This is sadly ironic since I accidentally left behind my maté in my apartment in Buenos Aires.) The yerba is packed into a hallowed-out gourd, which is then filled with boiling water. You drink the mixture directly from the gourd using a metallic straw with a filter at the bottom, called a bombilla. Some people walk around with a thermos of hot water and the gourd to drink maté whenever they have the urge. It has a very strong, bitter taste, but you can add liquid sugar. From the Dominican Republic: Some large jugs of the tree bark, sticks and herbs that can be used for making the classic Dominican drink mamajuana. I assume the Displaced Nation has honey and rum we can add to it? After filling with rum and honey, you let the jug sit for a few days. You can also add cinnamon sticks soaked in red wine and honey, or raw squid and seafood soaked in rum. Men use the seafood mamajuana to boost their virility. Regular mamajuana supposedly cleans the blood, provides a tonic for liver and kidneys, relieves menstruation pains, and cures many other ailments (depending on who you talk to). I would make the meal I ate the most of in the Dominican Republic: rice, beans, plantains, and overcooked spaghetti with carnation milk, canned tomatoes, and corn. It’s the perfect carb overload — are any of you marathon runners? From the Dominican Republic: Vaina — though it technically means the pod around pigeon peas (gandules), everyone uses it to mean a thing or object. If I ever got stuck and couldn’t think of the Spanish word for something, I would just call it vaina while pointing to the object with my lips. It’s a great word for anyone learning Spanish. Strangely, I have never had a role model for this kind of travel. I was always drawn to it — but for some reason never felt the need to seek out others who had done it before me. 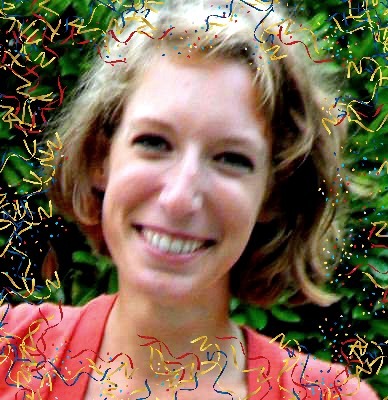 My family were against my joining the Peace Corps because of fears for my health and safety. A psychic I met at a Renaissance fair right before leaving for Argentina told me I was going to do the Peace Corps. I don’t really believe in psychics but everything she told me that day has come true. So perhaps it was simply a matter of fate? Voluntourism is a tricky subject for me personally. On one hand I feel that it is ridiculous to pay someone’s plane ticket, lodging, food, and transportation at a more luxurious level than any host country national has ever experienced to have them “volunteer” and do a job that a local person would probably be more than willing and capable of doing had all that money been spent on their salary. On the other hand, I do realize the value of cross-cultural communications for both parties and that, on the occasions when it’s done correctly, the volunteer might actually be able to transfer a valuable skill to the host country nationals. In short, it all depends on how the voluntourism is being executed. While in the Dominican Republic, I observed many volunteers who were asked to do jobs that could have been, and in some cases even were once done by Dominicans. It wasn’t that the local population didn’t have the knowledge or training to do some of these jobs; it was that they didn’t have the money to pay a salaried person and wanted a “free” volunteer instead. Luckily, most Peace Corps volunteers were successfully trained to avoid taking jobs away from Dominicans, and instead focus on areas where they and their community felt the need was greatest. img: Hair washing ritual in Constanza, a mountainous area of the Dominican Republic, in spring of this year. 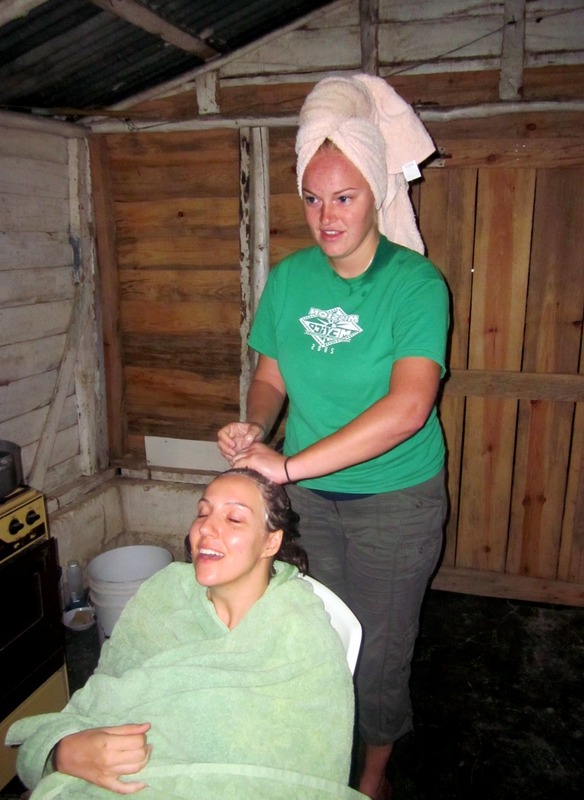 Adria Schmidt is the one getting her hair washed — the one doing the washing is Rebecca, a fellow Peace Corps volunteer, and they are in the home of another Peace Corps volunteer, Malia (not pictured). Due to the primitive plumbing conditions, hair washing has to be done in the kitchen, by heating water up on the stove. Countries, states, cities lived in: Zimbabwe (Mutare & Harare): 1999 & 2002-04; Michigan (Detroit): 1999-2000; Pennsylvania (Pittsburgh): 2000-2002; Namibia (Windhoek): a few months in 2001; Malawi (Lilongwe): 2004-05; California (Santa Cruz): 2005-10; Washington, DC: two weeks ago-present. I grew up on a pig farm in Bruning, Nebraska, population 248. The graduating class of my secondary school had 16 people. Every time the phrase “it takes a village to raise a child” is uttered, I think “If only they really knew…” Thinking back, there were two very important teachers, one in high school, and another at university, who were extremely influential in shaping and expanding my world view. And my parents certainly raised me to cultivate a curiosity about life. This, along with my insatiable, youthful desire to get as far away from Nebraska as possible, was a combustible mix that shaped my career and life path. I was the first person in my family to go or live abroad. I don’t think I even knew anyone who had been to Africa before my first trip abroad, at age 19. On the bustling Nelson Mandela Avenue in Harare, Zimbabwe, in 2003. I always hated driving to city centre, but a colleague and I had to go to the immigration office to update our work permits. When we came out of the office, our car was blocked by another on the street. So we just got into the car and waited. Eventually a man came up my driver’s side window and tapped on the glass. Not knowing him, I rolled the window down a couple of inches. This seemed to anger him and he walked away to talk to another man, a companion of his, who started yelling out to walkers-by that this white woman [me] would not roll down my window — I must think Africans are “stinky,” on and on… Luckily people didn’t engage him. There was a dynamic going on that I didn’t understand — apparently, I had parked in the man’s space, and he felt justified in scolding and harassing me for that. After a few more minutes, the original man came back to my window, pulled out his wallet and his War Veterans identification card, placed it up against the glass and menacingly dragged it across. And then it made sense. The card, along with the man’s demeanor, indicated that he was probably one of the veterans of Zimbabwe’s war for independence, who’d been recruited by the Mugabe government for help in brutally suppressing opposition demonstrations, in murdering and torturing opposition leaders, and in seizing land on behalf of the government elite. Eventually, the man had had enough with me. He motioned for the car behind me to move, and I backed out and drove away very quickly. Obviously, my experience that day was nothing compared to the very real and severe political violence and torture experienced then and now by Zimbabwe’s opposition supporters. If I felt displaced, imagine how black and white Zimbabweans felt who were violently displaced from their lands on behalf of so-called fast-track land resettlement. And on another level, my experience was nothing compared to the everyday torments of living in a country where in a sense everyone (war veterans included) has been displaced from a state of personal dignity and safety, through subtle yet deliberate expressions of power. Also in Zimbabwe — when talking with a group of local leaders in 2008. We were sharing stories about the issues women face in their struggles to raise families and improve their communities. One woman shared a brilliant story of triumph from being a physically and emotionally abused wife to now owning her own hairdressing business. She cried as she bravely told us about her life, and many others shared her tears. Because I was there as a visitor, I was expected to respond (through a translator), and I took a chance in trying to break the tension and make the moment a bit lighter. I told her that I could tell she was a hairdresser because her plaits [braids] looked so perfect. After the pause in which the translator shared what I had said, the room erupted in laughter. We were all reminded, no matter where we were from, of the sweetness of laughter through tears. I had quite the African basket collection going for a while until they were stolen from my storage unit in Santa Cruz. That’s all the thieves got since I was in the process of moving at the time. Their house probably looks really cool now. Zvakaoma. This is a phrase in Shona that means, “it’s tough” or “it’s difficult.” It also roughly translates to “shucks” in English or “c’est la vie” in French. It was a phrase I heard often in Zimbabwe because of the severe economic downturn and the unavailability of basic commodities and cash during my time there. To my ears, it was a very compassionate phrase. Zvakaoma — I lament with you; I feel your frustration and pain. Sometimes a well-timed zvakaoma can get you through your day. This month we are looking into “philanthropic displacement” — when people travel or become expats on behalf of helping others less fortunate than themselves. Do you have a role model you look up to when engaged in this kind of travel — whose words of advice you remember when you find yourself in a difficult situation? Great question — one that we aid workers should always be asking themselves as well, because how we go about developing our role or calling can have an impact on our effectiveness as helpers. Helping is hard. Unfortunately, there aren’t any simple solutions to aiding the poor. Having worked in international aid and philanthropy for over a decade, I’ve come to admire the people who have managed not to totally lose their idealism and commitment to the work. So many aid workers become jaded and cynical — I can’t help but wonder if this hinders their effectiveness in the field. In addition, I really look up to the leaders of local nonprofits and grassroots organizations in the countries where I’ve worked. I’ve had the privilege of working with over three hundred such groups in southern and eastern Africa during my career. Most were linked to local churches, schools, or clinics though some were also independent. They extend support and services into areas that are not reached sufficiently by government or international agencies. The web of local initiatives in the developing world is still largely undocumented, unrecognized and under-resourced. WiserEarth.org conservatively estimates there well may be over a million such groups around the world! In my experience, these local leaders are there for kids, families and communities, whether funding or support from outsiders is available or not. Watching them and their persistence keeps me going. First, nothing is likely to stop the increase in person-to-person contact between people of the richer nations and people of the poorer. Second, there is much to be gained on both sides from this exchange. Third, those gains will be made through a series of small, personal, humbling errors. 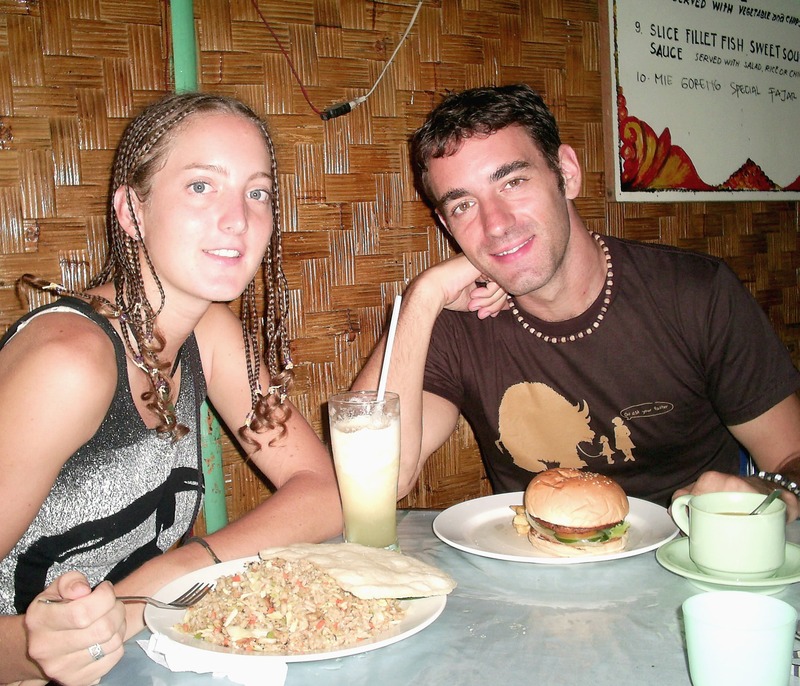 To anyone considering voluntourism, I can recommend PEPY Tours in Cambodia. It’s doing voluntourism responsibly, thoughtfully, and respectfully — and has a great blog to follow, Lessons I Learned. In general, I’d advise volun-tourists to ask critical questions of whatever project or trip in which they’re involved. Link the big issues to what you’re trying to do locally. It’s important to be curious about the root causes of poverty and vulnerability and what is needed for long-term change. Commit yourself to this learning process and never stop asking the deeper questions, whether it’s your first trip abroad or you’ve been working “in the field” for decades. Finally, don’t let your good work become all about you. Place local people’s efforts before your own, in order to foster ownership and sustainability. Remember that whatever you do will always be secondary to the relationships you build. 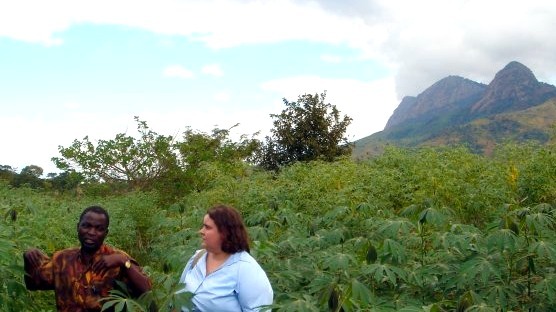 img: From corn to cassava — Jennifer Lentfer talking with farmer and local leader Jones Pilo in Zomba, Malawi (2007).